1. In a small bowl, sprinkle the yeast over the warm water. Add the pinch of sugar, stir to dissolve, and let stand until foamy, about 10 minutes. 2. In a large bowl, beat the 6 tablespoons sugar, the butter, salt, and vanilla or cardamom together with a wooden spoon or a heavy-duty electric mixer until light and fluffy. Add the eggs and beat well. Add 1 cup of the flour and beat until smooth. Add the milk, then gradually add 2 cups of the flour, 1 cup at a time, beating well. Stir in the yeast mixture. Gradually add enough of the 1 1/2 to 2 cups remaining flour to make a soft dough. Turn out on a floured board and knead until smooth and elastic, 8 to 10 minutes. Place in a buttered bowl, turn to coat, and cover with plastic wrap or a damp tea towel. Let rise in a warm place until doubled in size, about 1 1/2 hours. 3. In a medium bowl or a food processor, mix the sugar, flour, butter, cocoa, and cinnamon together. Cut the butter in with your fingers or process until crumbly. 4. Punch down the dough and turn it out on a lightly floured board and knead lightly until smooth, 1 or 2 minutes. Cut the dough in half. Roll one half into a 10-by-14-inch rectangle. Spread evenly with half of the Chocolate Streusel. Roll up and place, seam side down, on a buttered baking sheet. Repeat with the remaining dough and filling, placing the loaf on a separate buttered baking sheet. 5. With clean scissors, snip each loaf at 3/4-inch intervals, cutting three-fourths of the way through the dough. Starting at one end, pull and twist each cut slice on its side to lie flat on alternate sides. Cover with a towel and let rise in a warm place until doubled in size, about 45 minutes. 6. Preheat the oven to 350°F (175°C). Brush the loaves with the egg white and sprinkle with the nuts. Place in the oven, reduce the heat to 325°F (160°C), and bake for 30 to 35 minutes, or until golden brown. Transfer the loaves to wire racks to cool completely. Cut into 3/4-inch-thick slices to serve. Or, wrap and freeze for up to 2 months. In a small bowl, combine 8 ounces almond paste, 4 tablespoons unsalted butter at room temperature, 2 tablespoons sugar, 1/3 cup (1 1/2 ounces) finely chopped almonds, and 1 egg. Beat until blended. Use instead of the chocolate streusel. This recipe was great to follow. I had never made a bread like this, and it produced a wonderful dough. The consistency was just terrific. The loaves rose very nicely into two plump loaves. The final bread was lovely and sweet, yet still remained light and fluffy. Great taste and very popular with all of my friends. 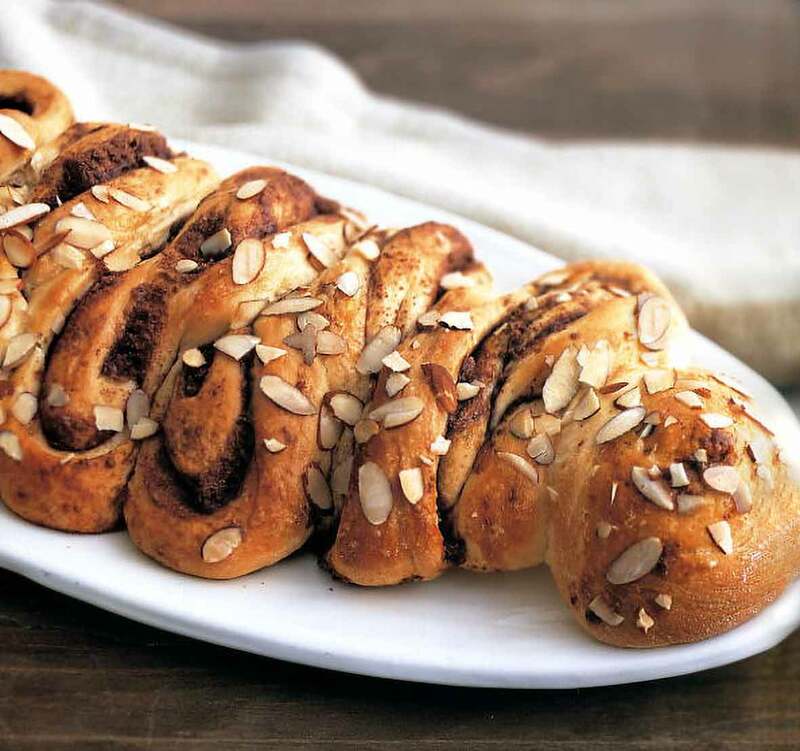 The combination of the chocolate and cinnamon gave the coffee cake that extra special touch. It keeps well and can be made the day before a party. This was a straightforward description and a great introduction to yeasted dough, which can be intimidating to those not familiar with working with yeast. The recipe yields an impressive looking result, and the chocolate-cinnamon streusel is delicious. 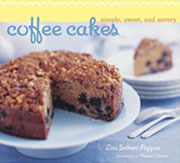 Danish Chocolate-Streusel Coffee Cake Recipe © 2006 Lou Seibert Pappas. Photo © 2006 Maren Caruso. All rights reserved. All recipes and photos used with permission of the publisher. Just doing our job, ma’am. just doing our job.